Latest & unique new designed bidet sprayer system for your rinsing & cleaning! Moolmang Vitamax Deluxe Bidet Sprayer System is latest and unique new designed bidet system for your rinsing and cleaning that registered design patent as bidet system. Also, it is simple and easy way to retrofit on your existing toilet and provide highest level of personal hygienic to clean yourself. Unique and sleek design bidet system allows to you easily rinse & clean all your bottom areas while comfortably sitting on the toilet. 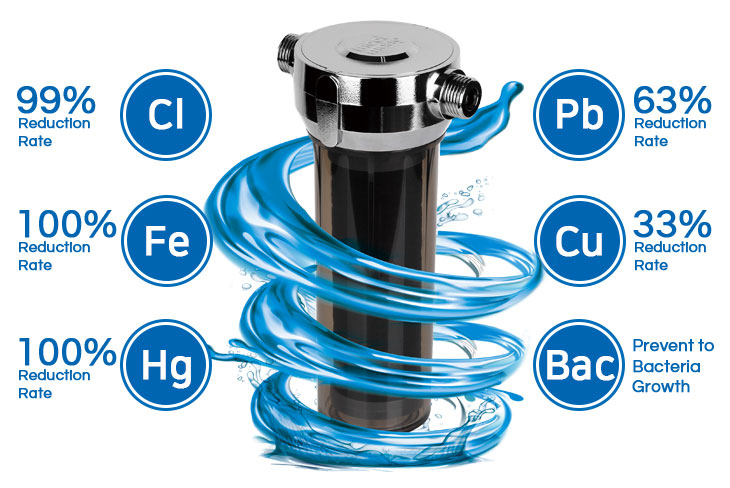 Remove residual chlorine, copper, lead, mercury, iron, bacteria, fungi, algae, mold, lime scale, heavy metal, harmful chemicals, find pollutants by 6 stage filtration system! Includes anti-drop hanger for convenient use & to prevent drop on the floor. Also, it is for easy to place the bidet sprayer on the position after use. Includes brass T-connector & on/off valve of high quality & durability to control the water pressure / flow going into the bidet sprayer. Also, it is includes elegant stainless steel flexible shower hose (59 inches). Easy to install and replace filter cartridge. : Removes rust, fine pollutants, algae, mold! : Adsorption of residual chlorine, harmful chemicals, heavy metal and odour! : Removes residual chlorine, copper, lead, mercury, iron, bacteria, fungi, algae, mold! : Prevent germ, bacteria growth!